During Victoria’s reign, the Court Drawing Rooms were held in Buckingham Palace at four stated periods every year–two before Easter and two after. 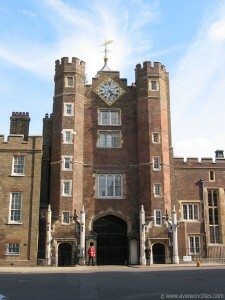 Levées, hosted by the Prince of Wales for the presentation of gentlemen, were held at intervals during the like season in St. James’s Palace. Though of lessening distinction as the Victorian period wore on, the delicious prospect of being presented to the Queen or Prince of Wales continued to be a beacon to ambitious social climbers. The lady wishing to be presented should be of good moral and social character. Presentation had to be made by someone who had already been presented. Full Court Dress: low bodice, short sleeves, and train to dress not less than three yards in length from the shoulders. Whether the train is cut round or square is a matter of inclination or fashion. The width at the end should be 54 inches. It is also imperative that a presentation dress should be white if the person presented be an unmarried lady and it is also the fashion for married ladies to wear white on their presentation unless their age rendered their doing so unsuitable The white dresses worn by either debutante or married ladies may be trimmed with either colored or white flowers according to individual taste. High Court Dress: dress of silk satin or velvet may be worn at Their Majesties Courts and on other State occasions by ladies to whom from illness infirmity or advancing age the present low Court dress is inappropriate. Bodices in front cut square or heart shaped which may be filled in with white only either transparent or lined at the back high or cut down three quarters height. Sleeves to elbow either thick or transparent. Trains, gloves, and feathers as usual. It is necessary for ladies who wish to appear in High Court Dress to obtain Royal permission through the Lord Chamberlain. This regulation does not apply to ladies who have already received permission to wear high dress. White gloves only should be worn excepting in case of mourning when black or grey gloves are admissible. As a lady on presentation does not now kiss the Queen’s hand as formerly she did she is not required to remove the right hand glove before entering the Presence Chamber. This order therefore is no longer in force and a lady wearing elbow gloves and bracelets will find it a great convenience not to be to take off her glove. It was compulsory for both Married and Unmarried Ladies to Wear Plumes. The married lady’s Court plume consisted of three white feathers. An unmarried lady’s of two white feathers. 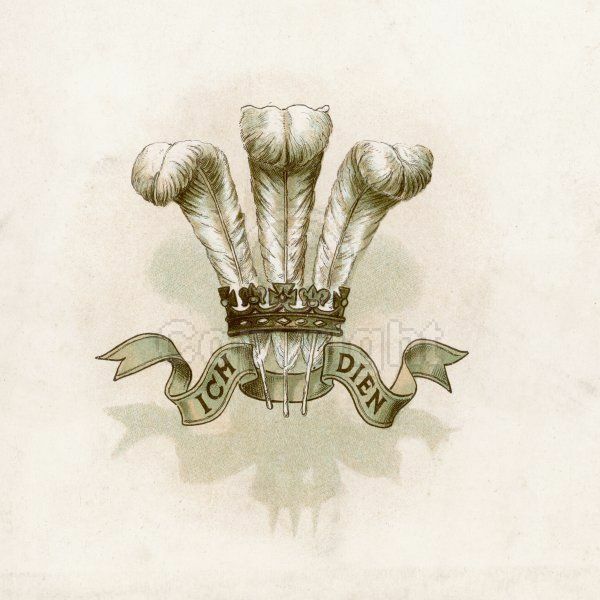 The three white feathers should be mounted as a Prince of Wales plume and worn towards the left hand side of the head. Colored feathers may not be worn. In deep mourning, white feathers must be worn, black feathers are inadmissible. White veils or lace lappets must be worn with the feathers. The veils should not be longer than 45 inches. Bouquets are not included in the dress regulations issued by the Lord Chamberlain although they are invariably carried by both married and unmarried ladies. It is thus optional to carry a bouquet or not, and some elderly ladies carry much smaller bouquets than do younger ladies. A fan and a lace pocket handkerchief are also carried by a lady on presentation or on attending a Court but these two items are also altogether optional. Armed with the proper arsenal, the young lady or new wife was ready to take London by storm. Queen Victoria held her presentations in the afternoon at 3 o’clock, which caused a traffic snarl of monumental proportions. It was common for the débutante to queue up in her carriage for hours down The Mall towards Buckingham Palace, boxed in on both sides by other equipages and the throng of curious onlookers. Then, once she alighted from her carriage, there was another long wait in the close, sweltering palace antechambers, where neither refreshments nor relief were available. The young lady who persevered to the end, however, got her rewards. Carrying her train over her left arm, she made her way through the groups of attendants to the anteroom or corridor where one of the lords-in-waiting, with his wand, spread out her train she’d let down, and walked forward to the Throne Room. Her name was announced as she curtsied before the Queen, so low as to almost kneel, and while doing such, she kissed the royal hand extended to her, underneath which she placed her own ungloved right hand. The peeress or daughter of a peer received a kiss from Queen Victoria. When the Princess of Wales stood in for Her Majesty, the lady being presented curtsied only and did not kiss the Princess’s hand. 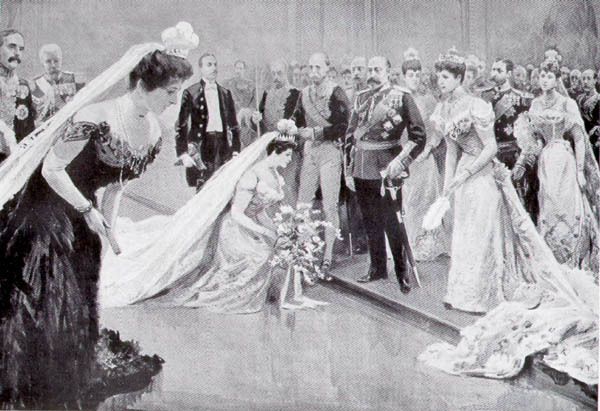 After passing Her Majesty, the débutante curtsied to any of the Princesses near her and retired backwards in what may be called a succession of curtsies until she reached the threshold of the doorway. The official in attendance replaced her train upon her arm and the presentation was complete! 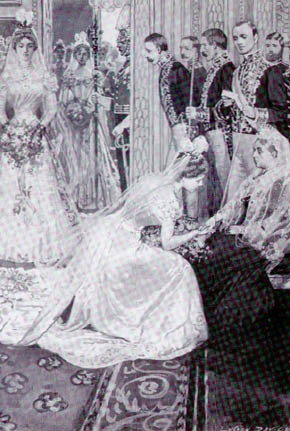 As was stated above, the reception of a kiss on the cheek from the Queen or the gift of one upon her hand was tossed out when Edward VII came to the throne. Other, more important changes were made to the presentation ceremony. Things were sped up by his reign, the drawing rooms and levees switched to the evening and held in June; the telephone used to summon a débutante’s transport, thus easing the traffic; buffet supper, served from tables laid with gold plate helped to revive waiting ladies; and the court photographers were allotted a room for speedy snapshots of the women. Levées were conducted somewhat on the same plan as that of the Drawing room but were confined exclusively to men who wear uniform or Court dress. Hosted by the Prince of Wales, later the King, those entitled to be presented to H.R.H./H.M. were members of the aristocracy and gentry, the members of the diplomatic courts, the Cabinet and all leading Government officials, Members of Parliament, leading members of the legal profession, the naval and military professions, the leading members of the clerical profession, the leading members of the medical and artistic professions, the leading bankers merchants and members of the Stock Exchange, and persons engaged in commerce on a large scale. An exception to the rule as regards retail trade was made in favor of any person receiving Knighthood ,or when holding the office of Mayor, or being made a Justice of the Peace, or on receiving a Commission in the Territorial forces. The Dress to be worn at Courts State Functions and Levees: Full dress uniform is invariably worn by all gentlemen entitled to wear it. All officers Scottish kilted corps should wear the kilt irrespective their being mounted officers or not. Gentlemen who do not wear uniform may wear either velvet Court dress new style; velvet Court dress old style; cloth Court dress. The new style velvet Court dress is of black silk velvet. The body of the coat lined with white silk and the skirt with black silk. Steel buttons. Waistcoat of white satin or black silk velvet. Breeches of black silk velvet, black silk hose, patent leather shoes, steel buckled, white bow necktie, white gloves, sword, black beaver or silk cocked hat. The velvet Court dress old style is very similar to the foregoing with the addition of a black silk wig bag at the back of the neck and lace frills and ruffles. The cloth Court dress consists of a coat of dark mulberry claret or green cloth with black silk linings, gold embroidery on collar, cuffs, and pocket flaps, gilt buttons with Imperial Crown, waistcoat of white corded silk or white Marcella, breeches of cloth color of coat, black silk hose, patent leather shoes, sword, white bow necktie, white gloves, black beaver or silk cocked hat. On certain days of the year, the so-called Collar days, high diplomatic and distinguished personages wear the collars and badges of the Garter, Thistle, St Patrick, Bath, and other Orders of Knighthood. The rules and regulations for being presented at a drawing room or levee were strictly adhered to, but the practically “open sesame” granted towards those who wished to enter society (with a little “s”), the air of exclusiveness granted court circles in the early decades of the Victorian era had nearly dissipated. Under the aegis of the convivial and bon vivant Prince of Wales, later Edward VII, anyone who could entertain and be entertained was welcome in his circles. It was a trend that, if not the numbers of middle-class men entering Parliament, the self-made millionaires being ennobled or knighted, or the hordes of Americans and Continental aristocrats flooding British shores for the season, hunting, shooting, racing, and other amusements–and vice versa–sorely tried the aristocratic and royal prerogatives that kept social climbers firmly out. By the 1880s, American writers cynically shared that “in time it became possible to achieve a Court introduction without the intercession of the American Envoy, simply by arousing, through means it would not be discreet to name, the interest of some English noblewoman whose exchequer was at a low ebb.” However that may be, this brief brush with royalty continued to be considered a stamp of social approval by nouveaux riches and foreign nobodies until its demise in 1958. I have a question.King Edward VII died in may 1910. Who were the debunates of 1910 presented to? And if the King died was there a london season that year? I can’t find any information on the london season of 1910–did it start in May or June. You know what Jennifer? That’s an excellent question! I’m not entirely positive, but I would think that court mourning–which lasted a year–meant all court functions were canceled. 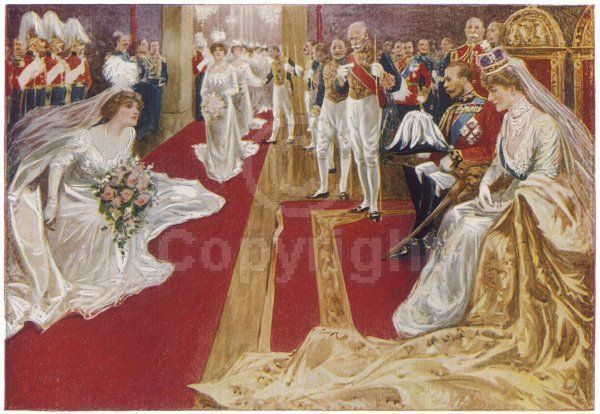 I would posit that no debutantes were formally presented after Edward VII died, until George V’s next court in the spring of 1911–of which I have documentation as occuring. And I have an article about the London Season here. Thank you so much for your reply. But, I have yet another question. I have read several accounts that King Edward VII held his court presentation in June not May. Since he died on May 6th 1910, did High-society still have a London Season meaning balls, and dinner parties, and all the rest of the events that make up the London season. Was there a private royal viewing at the Royal academy or was that canceled as well? I have dates that the Private viewing was always scheduled on the first monday of May. Is that true? I think I have that same guidebook! Baedeker’s London, right? I’ve done some digging, and according to a few New York Times Articles, Edward’s death threw the Season for a loop and Americans (since NYT is a US paper) withdrew from the capital to take part in the Parisian season. King George contemplated lessening mourning, but didn’t. Since the infamous “Black Ascot” has remained in our consciousness, I think the general markers of the London Season continued, but any true gaiety was absent. I think there wouldn’t be any court presentations for a year, but a debutante could come out in a private setting (as I said in this article, the court presentation had lost its social cachet for English high society, save social climbers and foreigners). Thank you so much. I now can move on. It is amazing how a small detail can point you in the right direction. I am having so much fun digging for information. Again thank you. I had a question about Debutantes during WWII: what was the environment like? I know they stopped in 1958, but was there any temporary hiatus because of the war? Thank you! Hi Kate, according to Karen Baclawski’s The Guide to Historic Costume, “Court presentations were again interrupted by war from 1940—5.” You’d have to read some memoirs written by aristocrats detailing life during WWII, but I don’t think young ladies were too concerned with debuting when their male friends and family members were in action. There was a bit of struggle against the entrance of aristocratic young women into nursing and female military units, but as the war progressed, class prejudices against action dissolved. If my reading memory serves correctly, Ascot took place in the 1910 Season. THe ladies wore black. Yes Ascot–and other public events–did occur in 1910, but I don’t believe court presentations took place, as the English court was in deep mourning for a year. How do you find out what dates Queen Victoria did receive people for presentation? Hi Mary, the dates for the presentations were announced in the newspapers of the day, so if you have access to archives for The Times, you would probably find them there. Otherwise, etiquette books just listed the general times during the season when ladies and gentlemen could be presented to the Queen. Did the newspapers of the day publish lists of those ladies presented at court? If so, what newspaper & section should I search under? 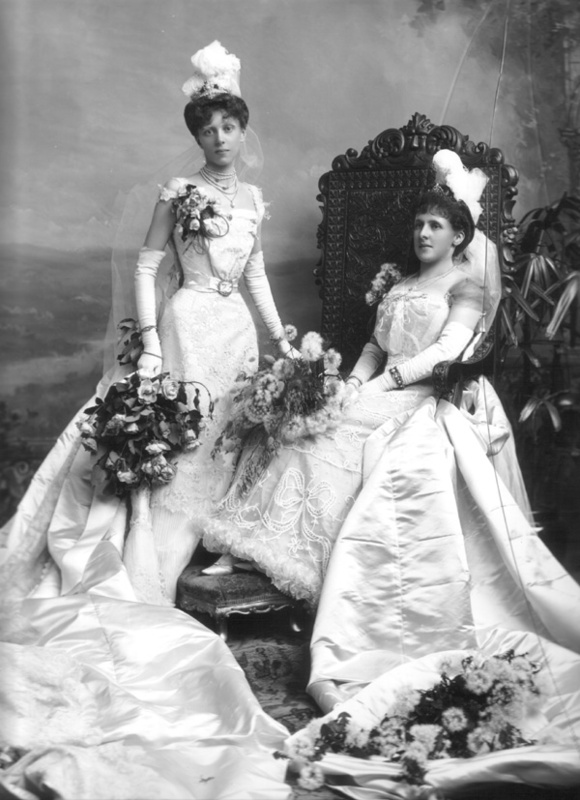 Apparently; there exists a list of all Debutantes who attended Court, up to the 1950’s (58?) cancellation and scapping of the event in general. Well my Grandmother apparently was a Debutante in the 1930’s. Her name then: (Miss) Renee’ June France-Hayhurst. I am reading this for the first time, and it is abit interesting. But then..they are announced, enter the room, curtsey the Queen and Princesses, and come out..Is that all? There should be something like the Queen having a conversation with the girl..All this charade just for a few minutes? Yep! The girls did not need a conversation with the Queen–the fact that they could be presented showed that the Queen considered them elite enough to be acknowledged in her court. What was the form of the actual invitation? [N]ine hundred and fifty invitations were issued for Friday evening, March 14th. Those for Royalty were delivered by hand by an equerry-in-waiting, who occupied a royal carriage when he went upon his errand; less exalted personages received theirs by post. The cards are like those sent out in the last reign for State balls, and are endorsed with the words that the Lord Chamberlain “has been commanded by their Majesties to invite” the lucky recipient “to a Court to be held at Buckingham Palace on such and such a date.” Each member of a family invited receives a separate card. “The Lord Chamberlain is commanded by Their Majesties to summon _________ to a Court at Buckingham Palace on Wednesday the 26th June, 1929, at 9.30 o’clock p.m.
Ladies: Court Dress with (underlined!) feathers and trains. Were girls from countries like Australia, Canada and so on eligible to be presented? If someone that was presented could vouch for them, then yes they were eligible. Yes they were. Both my grandmother and her mother, as well as her sister, we’re presented at Court in the 1920s. They were all from Ottawa. I have a question that occurred to me as I was reading the descriptions of the head dress for ladies. How far back did the custom of ladies wearing three feathers go when being presented at court and when did that stop in favor of spectators? I’m not sure. They’ve been associated with the Prince of Wales for centuries, however. Sorry if I’ve misunderstood, but girls from English colonies were eligible to be presented (as said below) – but American girls, except in the later years, were not? But they attended other functions during the season? Thanks! Without knowing the specifics of the commenter below, what I can say is that girls had to have a sponsor. The point of the court presentation was for ladies of the nobility to make themselves known to their sovereign. If a non-aristocratic girl could find someone who had already been presented and didn’t have any scandal attached to their name (nor was divorced), they could submit their names to the Lord Chamberlain to be presented. I hope this is the correct forum to ask this question. When the Queen of England attends an event with Phillip, is he ‘escorting’ her? Is the verb ‘escorting’ used to denote his being by her side? Thanks.